Throughout time, people have feared and marveled at eclipses. Major solar eclipses have found their way into literature, songs, histories, and philosophical and divinatory texts. Many people, including many astrologers, consider solar eclipses to be negative omens or indicative of times during which one should be especially cautious. The sun supports all life on our planet. The sun is also a living symbol of wisdom and clarity. So sunlight obscured=not so good. I don’t disagree with the omenology of solar eclipses as it has developed through time. However, from a more Tantrik or direct realization perspective, we can deepen our relationship to solar eclipses. Having done so, we can understand why a total solar eclipse is a marvelous time to do spiritual practice. Human beings can have a direct perception of primordial, immanent consciousness. When we do so, we can recognize the light of consciousness in everything everywhere. However, our degree of awakeness increases more quickly when we can find that immanent light in darkness. This includes being able to connect with wisdom, or living presence, when we ourselves are experiencing dark times; being able to recognize the light of wisdom in people who upset us; being able to wake up in our dreams when our minds are shrouded in unconsciousness; and literally being able to see the light that permeates all darkness. During a solar eclipse, Nature is giving us a wonderful opportunity to travel deeper into the darkness and to discover the light of living presence there. By spending the eclipse doing meditation or mantra, we can develop more capacity to discover the light of wisdom in all of life’s circumstances and in ourselves. 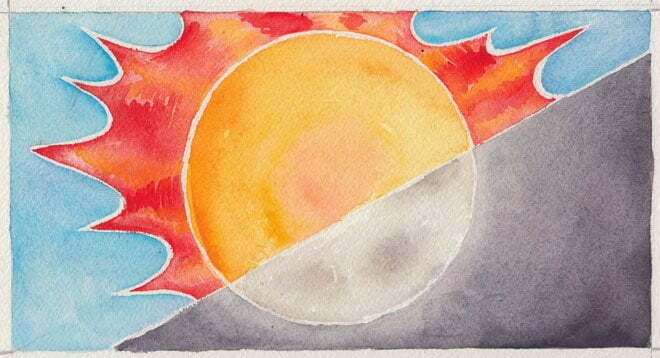 The second way we can related to the eclipse is as the merging of the sun and the moon. This is a cosmic-sized version of what happens in our subtle bodies when we have been doing kriya yoga for a long time. It may happen that ida and pingala nadī spontaneously merge into the central channel (sushumna nadī). Ida is a living symbol of the Moon. Pingala is a living symbol of the Sun. Sushumna nadī is that out of which all of our experience in duality is being manifested. When we merge our dualistic experience (Sun and Moon) into the center, we can encounter the unconditioned: the mind of God. During an eclipse, all of Nature is performing the dissolution of dualistic experience back into the unconditioned. While we first experience this as darkness, or emptiness (shunya), going deeper, we encounter light and the fullness of awareness or consciousness. So my advice is to stay home and do some kind of seated practice from the beginning until the end of the upcoming total solar eclipse. We don’t get an opportunity such as this very often. Why not take Nature up on its offer and journey into the dark? The lovely water color accompanying this article was painted by Susan Fauman, a jeweler, painter, ayurvedic educator, yogini, and mom. NextBoring or Magical? You Choose.